March 28, 2016 – The last decade has seen a bonanza of exoplanet discoveries. Nearly 2,000 exoplanets — planets outside our solar system — have been confirmed so far, and more than 5,000 candidate exoplanets have been identified. Many of these exotic worlds belong to a class known as “hot Jupiters.” These are gas giants like Jupiter but much hotter, with orbits that take them feverishly close to their stars. At first, hot Jupiters were considered oddballs, since we don’t have anything like them in our own solar system. But as more were found, in addition to many other smaller planets that orbit very closely to their stars, our solar system started to seem like the real misfit. “We thought our solar system was normal, but that’s not so much the case,” said astronomer Greg Laughlin of the University of California, Santa Cruz, co-author of a new study from NASA’s Spitzer Space Telescope that investigates hot Jupiter formation. 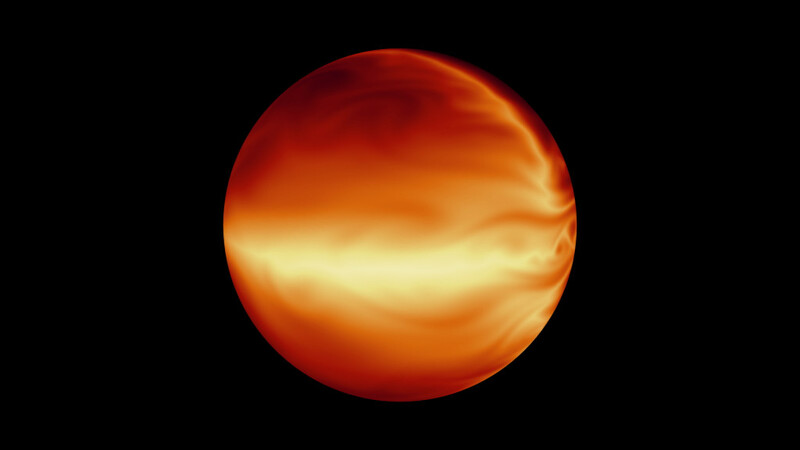 As common as hot Jupiters are now known to be, they are still shrouded in mystery. How did these massive orbs form, and how did they wind up so shockingly close to their stars? The Spitzer telescope found new clues by observing a hot Jupiter known as HD 80606b, situated 190 light-years from Earth. This planet is unusual in that it has a wildly eccentric orbit almost like that of a comet, swinging very close to its star and then back out to much greater distances over and over again every 111 days. One side of the planet is thought to become dramatically hotter than the other during its harrowing close approaches. In fact, when the planet is closest to its host star, the side facing the star quickly heats up to more than 2,000 degrees Fahrenheit (1,100 degrees Celsius). “As the planet gets closer to the star, it feels a burst of starlight, or radiation. The atmosphere becomes a cauldron of chemical reactions, and the winds ramp up far beyond hurricane force,” said Laughlin, a co-author on the Spitzer study, which is accepted for publication in The Astrophysical Journal Letters. HD 80606b is thought to be in the process of migrating from a more distant orbit to a much tighter one typical of hot Jupiters. One of the leading theories of hot-Jupiter formation holds that gas giants in distant orbits become hot Jupiters when the gravitational influences from nearby stars or planets drive them into closer orbits. The planets start out in eccentric orbits, then, over a period of hundreds of millions of years, are thought to gradually settle down into tight, circular orbits. 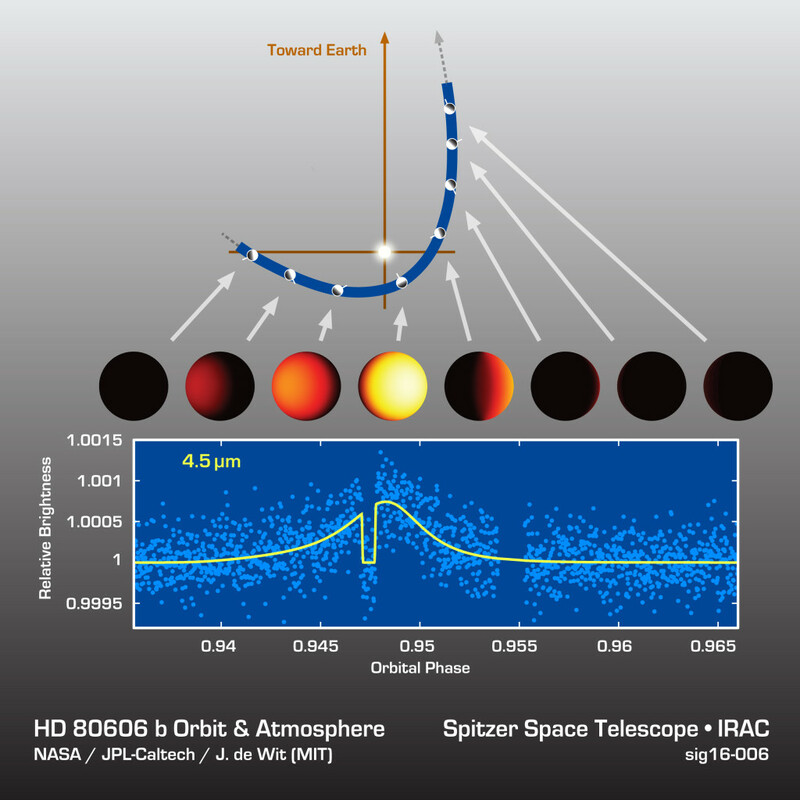 Spitzer previously studied HD 80606b in 2009. The latest observations are more detailed, thanks to a longer observing time — 85 hours — and improvements in Spitzer’s sensitivity to exoplanets. A key question addressed in the new study is: How long is HD 80606b taking to migrate from an eccentric to a circular orbit? One way to assess this is to look at how “squishy” the planet is. When HD 80606b whips closely by its star, the gravity of the star squeezes it. If the planet is squishier, or more pliable, it can better dissipate this gravitational energy as heat. And the more heat that is dissipated, the faster the planet will transition to a circular orbit, a process known as circularization. “The long time scales we are observing here suggest that a leading migration mechanism may not be as efficient for hot Jupiter formation as once believed,” said Laughlin. The Spitzer study suggests that competing theories for hot Jupiter formation — in which gas giants form “in situ,” or close to their stars, or smoothly spiral inward with the help of planet-forming disks — may be preferred. The new study is also the first to measure the rotation rate of an exoplanet orbiting a sun-like star. Spitzer observed changes in the planet’s brightness as the planet spun on its axis, finding a rotation period of 90 hours. “Fifty years ago, we were measuring the rotation rates of planets in our own solar system for the first time. Now we are doing the same thing for planets orbiting other stars. That’s pretty amazing,” said Laughlin. A rotation rate of 90 hours is much slower than what is predicted for HD 80606b, puzzling astronomers, and adding to the enduring mystique of hot Jupiters. Additional study authors are: Nikole Lewis of the Space Telescope Science Institute in Baltimore; Jonathan Langton of Principia College, Elsah, Illinois; Drake Deming of University of Maryland, College Park; Konstantin Batygin of the California Institute of Technology, Pasadena; and Jonathan Fortney of the University of California, Santa Cruz. NASA’s Jet Propulsion Laboratory, Pasadena, California, manages the Spitzer Space Telescope mission for NASA’s Science Mission Directorate, Washington. Science operations are conducted at the Spitzer Science Center at Caltech. Data are archived at the Infrared Science Archive housed at the Infrared Processing and Analysis Center at Caltech. Caltech manages JPL for NASA. Spacecraft operations are based at Lockheed Martin Space Systems Company in Littleton, Colorado. Ball Aerospace of Boulder, Colorado, built the Cryogenic Telescope Assembly — considered the “eyes” of Spitzer — and two of the three science instruments.